Systematics is a rapidly changing field and DEB strives to serve our community while incorporating an ever-changing understanding of the natural world. As the amount of information and data the systematics and biodiversity community gathers grows in quantity and breadth, researchers are looking for ways to incorporate new and existing data layers into the framework of the Tree of Life. Even with advances in next-generation sequencing, MRI/CT imaging, and other methods, there is still a tremendous amount of undiscovered, overlooked, or understudied biodiversity. 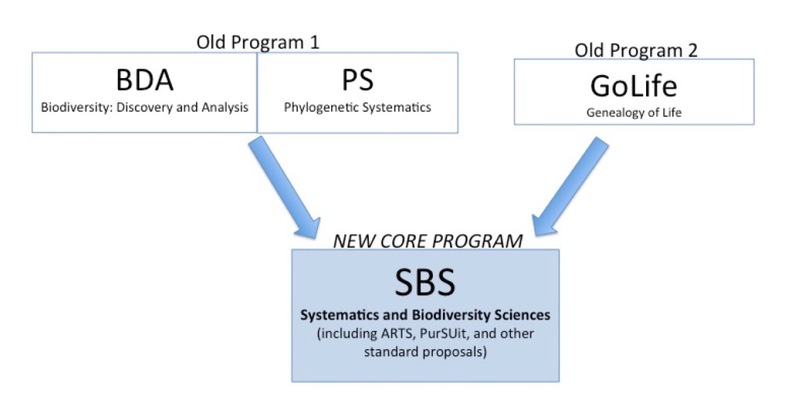 In response to progress in the field of systematics and biodiversity and based on the number of recent submissions to different DEB solicitations, the Systematics and Biodiversity Sciences (SBS) cluster has decided to reorganize its program structure and offerings. These changes will not affect the kind of grants you can submit in terms of funds, scope, or topic. As in the past, ‘ARTS: Advancing Revisionary Taxonomy and Systematics’ proposals, for taxonomic revisionary and monographic research, will continue to be accepted in SBS. What does this mean for you? If you have a taxonomic revision or monographic research project, you can submit to the core program using the prefix “ARTS” in your title (e.g., “ARTS: a monograph of unicorns”). If you are studying very poorly known parts of the Tree of Life you can submit to the core program and use the prefix PurSUiT (e.g., “PurSUiT: Discovery and description of new lineages of poorly studied laser cats”). You will still be able to submit grants with the other more widely used prefixes (e.g. SG, RUI, CAREER, and OPUS). These new programmatic changes won’t be in effect until the start of the next fiscal year (October 2017). SBS is always looking for the best research in systematics and biodiversity and our capacity to fund exceptional work in our field has not changed. These programmatic changes are in response to progress in the field and submissions to different solicitations; it does not reflect any decreased interest in systematics and biodiversity research within NSF. We hope this simplification and refocusing will help further improve our understanding of life on Earth, the training of future systematists and field biologists and our ability to review and fund the best phylogenetic, taxonomic, and biodiversity research. Details about the programmatic changes in SBS can be found in a Dear Colleague Letter (NSF 17-052) and FAQ document (NSF 17-054). If you have additional questions, please reach out to a DEB Program Officer. This entry was posted in Dear Colleague Letter, Program Announcements. Bookmark the permalink.